Jenkins Marine > Jenkins Marine Latest News > Equipment and Infastructure > Who You Gonna Call? Who you gonna call? Jenkins Marine obviously! Well, when you have a marine emergency anyway. 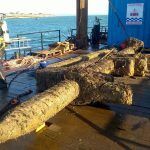 And that’s exactly who got called to carry out some emergency piling work in Poole when part of the quayside collapsed. 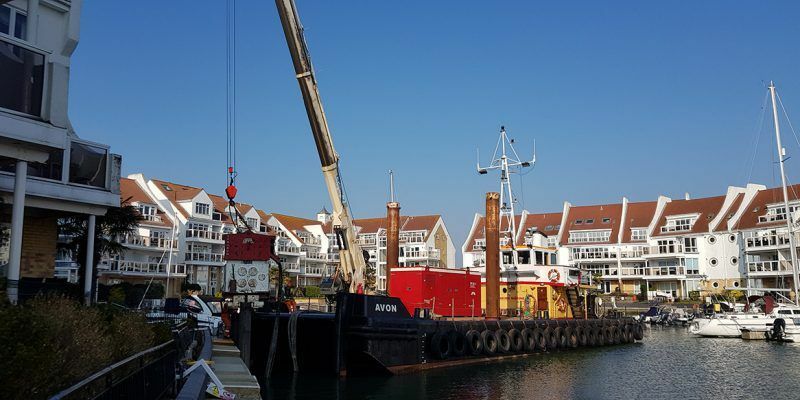 Jenkins Marine Vessel Avon has been hard at work adding the 14m long steel piles needed to shore up the quayside. 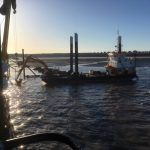 To carry out the remedial work Avon has been using a large 18VM vibro hammer, which weighs in at 6.2t, and a 10t hydraulic power-pack on the deck to drive the piles deep into the sea bed and prevent further collapse. 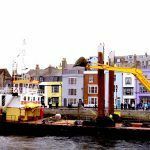 We await the detailed design from the structural engineers before work commences on a permanent solution to secure the quay wall for years to come.